Pirates For Hire is the first of its kind. This is a live action, award winning pirate-themed entertainment troupe specializing in action/comedy pirate performances which involve cutlass fighting, pistol firing, and breakaway bottles. We have performed in over 100 cities across California, Utah, Nevada, Arizona, Alaska, Texas, and Canada for clients that include IBM, The Walt Disney Company, Parker Aerospace, and The Los Angeles Natural History Museum. Pirates For Hire Video – Watch Our Demo Video! 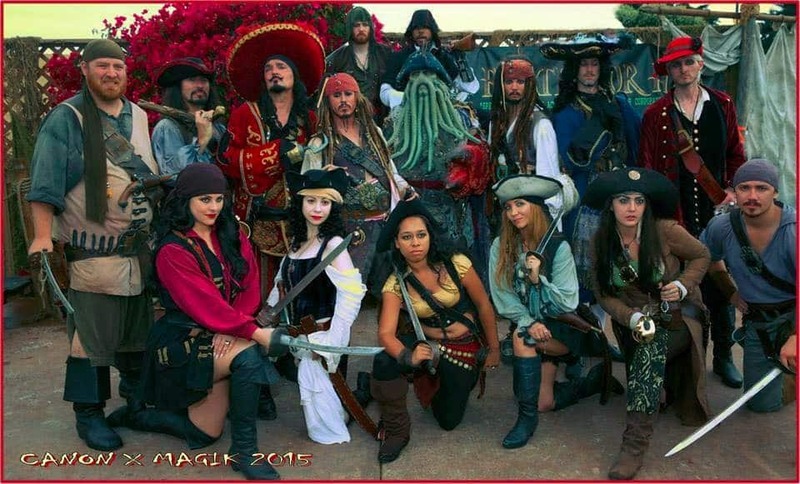 We were established during the summer of 1998 when actor/stunt coordinator Ted Shred and about nine other pirate enthusiasts/actors got together for the purpose of bringing a new element of atmosphere and entertainment to private and corporate parties. There were circus parties, cowboy parties, etc., but no one was doing what Ted felt was an incredible party theme: “Pirate Parties”! We bring the element of fun, excitement, and adventure to every event, whether it’s a child’s birthday party, a corporate event, a parade, a multi-day festival, or a charity fundraiser. We have a large fan base that we take pride in and it keeps growing with each event. 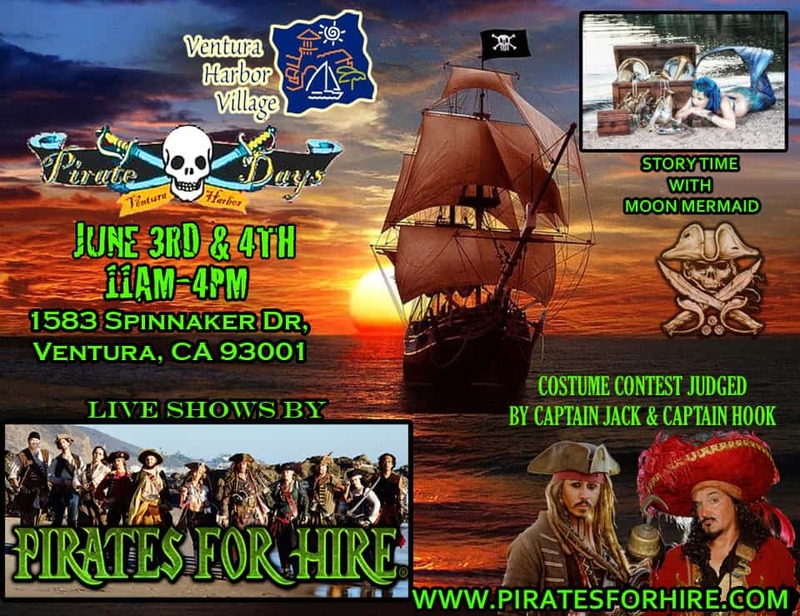 Our fans, guests, and clients will all attest that there is nothing comparable to a Pirates for Hire event. Our business is entertainment! Utilizing our skills of improvisation, comedy, acting, stunts, and audience participation, we can create a memorable adventure and an outrageously fun time for all! We own a vast array of detailed, over-the-top movie props such as cannons, treasure chests, barrels, anchors, ship wheels, lanterns, netting, gibbet cages with pirate corpses, and ship masts with sails. We can design and create a pirate tavern, a shipwreck encampment, or pirate’s lair. We also provide exotic animals such as parrots, monkeys, alligators, pelicans, and snakes. We even have a Lexan bar complete with an 18ft., 150lb. python inside! There’s really no limit to the fun… if you need an elephant, give Ted a call! All our animals and handlers are highly rated in the film industry and are exceptionally adapted to public display and educational environments. 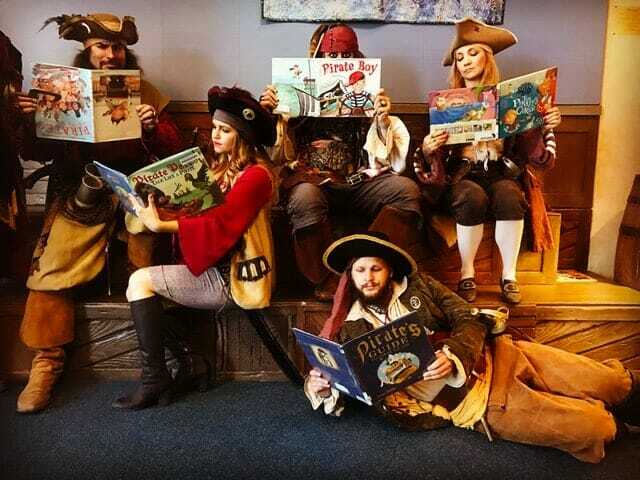 Since our beginnings in the late 90’s, Pirates for Hire has developed and grown to over 20 professionally trained actors and techs with many film and television credits that you and your guests will definitely recognize, especially from the Pirates of the Caribbean trilogy. Our pirate guys and gals are highly trained in stage combat, black powder weaponry, bullwhips, swords, daggers, boarding axes, etc. Our highly detailed and distressed costumes allow us to become the most believable pirates you’ve ever seen! Our look-a-likes are considered the best by our clients. We also provide top quality pirate bands and variety acts like pirate-themed magicians, fortune tellers, pick pockets, belly dancers, fire performers, precision knife throwers… and so much more! If you can think of it, odds are that we can do it! Pirates for Hire is a registered trademark. Happy Birthday Camarillo Library. Yes pirates know how to read . Book Pirates For Hire for pirate story time.